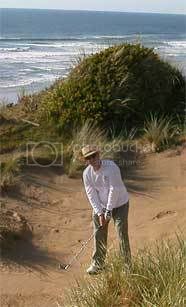 TheJoyofGolfing.com (JOG) is an “emerging” home for my writing on golf. It’s soon to be a book, maybe a magazine column (anyone interested?) and then an inspiring corporate golf keynote presentation on success with ease. Sincerely, the life lessons that I’ve learned from golf have changed my life. Of course, there is real joy in playing this silly game in naturally beautiful places; but more than that, I’m learning that “swinging easy” can be a central methaphor for living in and from the “sweet spot” of life. I’m still learning… Of course, it’s much easier to say “swing easy” than to do it… especially to do it consistently. But I’m making progress. The journey is it’s own reward, and my life is a better place for it. I hope you’ll come back and visit this site (or use the RSS feed linked via the upper right hand tab to subscribe… or you may also subscribe by email on that page… and please share your own experiences via the spaces for integrated blog comments). Oh yeah, “JL” is Jon Leland. Here are links to my professional bio and my more techie blog.